In boating, a fender is a bumper used to absorb the kinetic energy of a boat or vessel berthing against a jetty, quay wall or other vessel. Fenders are used to prevent damage to boats, vessels and berthing structures. To do this, fenders usually have high energy absorption and low reaction force. Fenders are typically manufactured out of rubber, foam elastomer or plastic. Rubber fenders are either extruded or made in a mould. 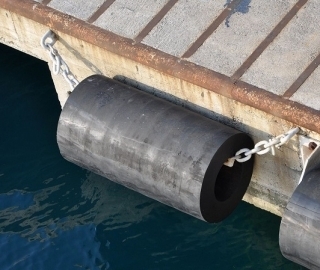 The type of fender that is most suitable for an application depends on many variables, including dimensions and displacement of the vessel, maximum allowable stand-off, berthing structure, tidal variations and other berth-specific conditions. The size of the fender unit is based on the berthing energy of the vessel which is related to the square of the berthing velocity. Historically, fenders were woven from rope in a variety of patterns. Fenders of woven rope are still used today by historic boat owners. Yachts, small leisure craft and support vessels typically have mobile fenders which are placed between the boat and the dock as the boat approaches the dock. Docks and other marine structures, such as canal entrances and bases of bridges, have permanent fenders placed to avoid damage from boats. Old tires are often used as fenders in such places. 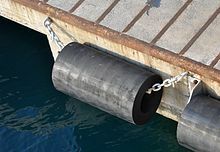 Dock Rubber Fender is an elastic buffer device of rubber use of ships dock edge. Mainly used to slow the ship and dock impact, or between ships in dock impact, or mooring process impact, to prevent or eliminate damage to a ship or dock Usually the rubber fender according to the structure can be divided into two categories: solid rubber fender and floating type rubber fender. The fenderboard is used to go alongside a pile. For bunkering operations between two vessels, floating fenders such as pneumatic or foam elastomer fenders are typically used. Cylindrical fenders are commonly used fenders which ensure a safe and linear berthing for different kinds of vessels. Cylindrical (extruded) fenders are an economical solution to protect most berthing structures, and offer ease of installation. In France, professional mariners call them “bougnafles”. Arch fenders were introduced to improve upon the performance of Cylindrical fenders. Arch fenders have a better Energy / Reaction force ratio and recommended for all types of applications. The shape of these fenders helps to dissipate the stresses evenly. 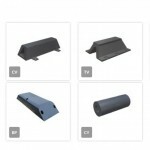 These extruded fenders are very easy to install and are maintenance free. Generally preferred for small to medium range vessels. Cell fenders are best employed for small or large vessels where Reaction Force is an important criteria. Among all types of fenders, Cell fenders offer minimum reaction per ton-meter energy absorbed. The very geometric shape gives it sturdiness, shear resistance, compact structure and the capacity to absorb energy equally from all directions. The Cylindrical buckling column absorbs axial loads effectively and buckles radially. This results in multi-directional dispersion of energy. 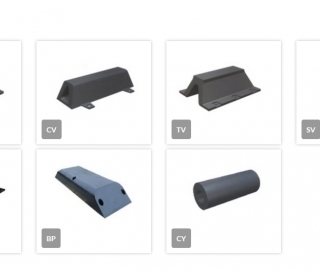 Cell fenders are the most durable rubber fenders available and are currently the largest moulded fenders made. 2000–2500 mm high cell fenders are typically used for LNG berths. In order to distribute the reaction force, cell fenders are typically supplied with large fender panels, which keeps the hull pressure low. Cone fenders are an improved version of Cell type Fender recently introduced and recommended for all types of applications including high tidal variation sites. This advanced feature of lesser height of fenders improves material handling capabilities of Deck / Vessel Cranes which reduces overall cost of the project. Due to the geometrical shape of the fenders it can deflect more and it can absorb more energy from any direction. Maintaining reaction force, but doubling energy absorption, can be achieved by using two identical cone fenders in a back-to-back arrangement. In order to distribute the reaction force, cone fenders are typically supplied with large fender panels, which keeps the hull pressure low. These fenders are extensively used for ship to ship transfers at mid seas, double banking operations, and as vessel-to-berth at dock/jetties. The special property of a pneumatic fender is its low reaction force at low deflection. This property of pneumatic fenders makes them the most suitable fender for liquid cargo vessels and defense vessels with very sensitive equipment. These fenders have excellent energy absorption characteristics and linear load deflection characteristics. Pneumatic fenders should comply to the ISO 17357 standard. The pneumatic fender is also known as the Yokohama fender or floating fender. There are four basic types of pneumatic fenders that comply with the international standard: Type I (Chain&Tyre Net Type), Type II (Sling Type), Type III (Rib Type) and Type IV (Rope Net Type). 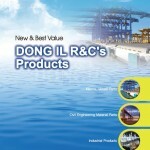 It has become an ideal ship protection medium used extensively by large tankers, LPG vessels, ocean platforms etc. The most appropriate type will depend on its application and the requirements of the equipment. The submarine hydro-pneumatic fender (SHPF), first developed in the 1980s, is a unique fender system designed to provide minimal hull pressure loads and soft compression during berthing and a large stand-off to accommodate the large bulbous shape of the submarine. Its pneumatic fenders body is stronger than standard pneumatic fenders and is equipped with a specially designed counter weight to keep the fender vertical in water. Each SHPF system is customised specially for each type or class of submarine, depending on its water-air ratio, shape of the hull, berthing-type, energy absorption and jetty design. These fenders are typically made of a closed-cell Polyethylene foam core, which is encapsulated in a nylon or Kevlar reinforced Polyurethane skin. The performance of foam elastomer fenders is comparable to that of a pneumatic fender, but the fenders will not lose their function in case the skin gets punctured. Foam elastomer fenders cannot deflate. D-type fenders are commonly used on vessels as well as small jetties. They are compression-moulded with steel inserts if required. Square fenders are commonly used on vessels as well as small jetties. They are compression-moulded fenders generally used on tugs, boats and ships. Wing fenders are compression moulded fenders and are generally used on tugs, boats and ships. Easy to install and replace. Do have excellent sea water resistance and resistance to ozone ageing and ultra violet rays. Keyhole fenders are the most versatile bow, stem fenders used on tugboats and small port craft/ferries. They offer maximum protection to tugs/ferries with their typical profile and load-absorbing capabilities. These fenders are made of high-abrasion-resistance rubber with good resilience properties. They are very popular with small port craft owners and tug owners. These fenders are compression moulded in high-pressure thermic-fluid-heated moulds and have excellent seawater resistance. Solid rubber fender dock ship application long history and wide range of anti-collision equipment. Can be divided according to the rubber fender force to shear, rotation and compression type and so on; according to the fender structure, solid rubber fender can be classified as type D type, Cone type, drum type, fan-shaped, rectangular type, cylinder fender and so on.Solid rubber fender with high energy absorption and reaction force, and has low cost, long service life, easy installation and maintenance advantages, dock, dock installed more protective device. There are a number of different standards used worldwide to design fender systems. The most commonly used one, is the PIANC “Guidelines for the design of fender systems, 2002”, which is the update of its predessecor from 1984. In Japan the Japanese Industrial Standards (JIS) are commonly used, whereas in the United Kingdom and the United States of America, the British Standard BS 6349:part 4 still used quite regularly. Designing a fender system basically is determining what the berthing energy of a vessel or range of vessels will be, then determine what capacity the fender needs to have to absorb that kinetic energy and finally how to find a way to avoid the reaction force creating too much hull pressure. In principle, a berthing energy calculation is a simple kinetic energy calculation, adjusted for specific behaviour of a berthing vessel or the specific characteristics of the berthing location or structure.